Photo Mix of Tam Valley RR. A Ken Burns style montage of my favorite photos set to blues music. Jul 18, 2008 - I demo'd Microsoft Train Simulator 2 at the National Train Show in Anaheim this morning. Took this video of the "railfan"viewof a train going over the Stevens Pass route. The software was quite fun and had much improved graphcs over the old version. As you can see from the sticker is due out "Holiday 2009" which I assume means December 2009. That is a long wait! 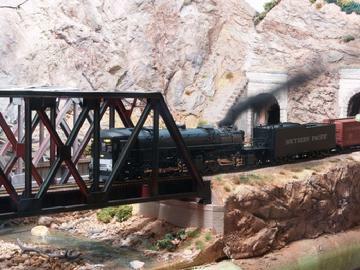 Cab forward 4100 emerging from tunnel into the Palisades Canyon and crossing the Humboldt River. The beeps you hear is the portable phone I use as the DCC controller. I am setting off the horn by pressing *2 on the phone.